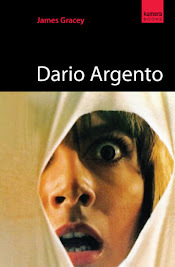 When a distraught man carrying a creepy Halloween mask is brutally murdered in his hospital, Dr Dan Challis teams up with the victim’s daughter to find out why. Their investigation leads them to the small Southern Californian town of Santa Mira and the bizarre Silver Shamrock toy factory that seems to hold sway over it. The snoopy duo soon discovers that the company’s sinister director has a diabolical plan involving ancient Celtic witchcraft, Stonehenge mysticism and booby-trapped Halloween masks to cull America’s ankle-biter populace. Not a sequel in the strictest sense of the term, Halloween III often gets a raw deal from critics and fans of the series. 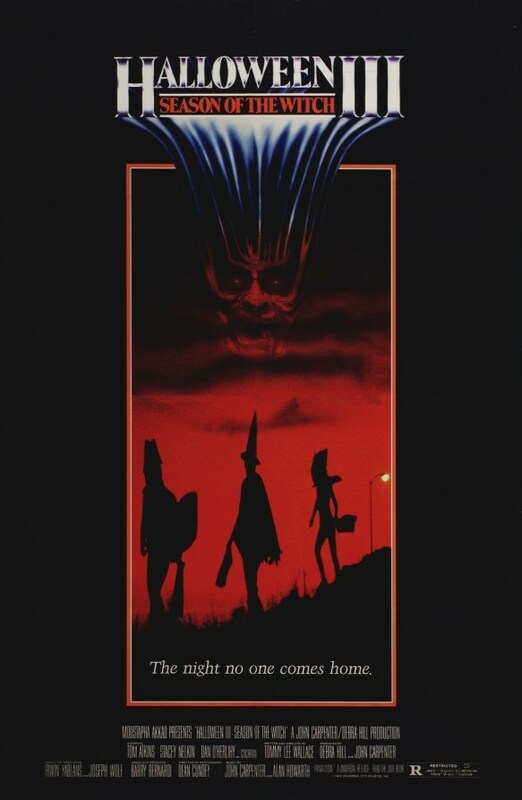 In an attempt to bring something fresh and interesting to the franchise, producers John Carpenter and Debra Hill planned to produce an anthology of films using the Halloween title and featuring different stories set in and around All Hallow’s Eve. As such, Halloween III: Season of the Witch bears no relation to the prior instalments featuring Michael Myers, Dr Loomis and Laurie Strode. It was a bold move on their part and while it isn’t entirely successful, credit where credit is due, at least they tried to experiment and produce something new and interesting. Produced on a budget of $2.5 million, Halloween III grossed $14.4 million at the box office in the United States, making it the least successful film in the Halloween series. Originally written by Nigel Kneale, the creator of the Quatermass saga, Halloween III’s distributor Dino De Laurentiis and producer John Carpenter thought the film would benefit from more graphic violence and bloodshed. As a result, Kneale felt the revisions to the script deviated too far away from his original vision and requested that his name be removed from the credits, leaving director Wallace to finalise the script. Despite not wishing to be associated with the film, Kneale’s influence is still heavily evident in Halloween III’s blending of science and supernaturalism and anti-authoritarian undertones. The film is populated by Carpenter regulars, both onscreen and off. 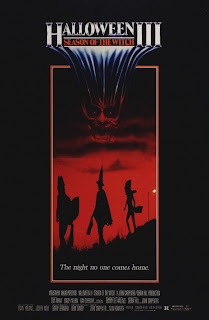 Director Wallace cut his teeth working on the original Halloween, Assault on Precinct 13 and Dark Star, while Carpenter reteamed with Alan Howarth to compose the film’s chilling electronic score. Tom Atkins had starred in The Fog alongside Jamie Lee Curtis and Nancy Loomis who also have small roles in Halloween III, as the voice of the phone operator and Dan’s ex-wife, respectively. Dean Cundey once again acted as director of photography, his masterful use of widescreen enhancing the film’s moody, sparse look – particularly evident in the taut opening scene. When considering what Halloween III is actually about - a mad scientist with an army of androids planning to annihilate America’s children by stealing a pillar from Stonehenge and inserting chips from it into mass-produced Halloween masks which turn deadly when activated – it does sound like a mildly ridiculous pantomime. 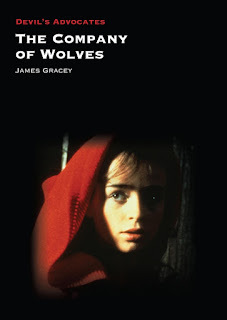 However despite the ludicrous story, it actually unravels as a dark, bleak and surprisingly upsetting film. While Wallace might struggle with the story and pacing at times, where he does excel is in conjuring an ominous atmosphere and deathly serious tone. Halloween III is pregnant with foreboding, effectively enhanced by Carpenter’s moody, doom-laden synth score that throbs eerily throughout proceedings. From the opening scene featuring a man running out of the darkness and being pursued through the stormy night by strange men in suits, the doomfully grim tone is established and never lets up until the queasy, downbeat denouement. Wallace steadily builds a stifling air of dread and paranoia, particularly when Dan and Ellie get to Santa Mira, with its myriad of CCTV cameras, strict curfew announced by a loudspeaker at the toy factory and enforced by the suited automatons (whose relentless advances, coldly mechanical movements and murderous precision mirror the actions of Michael Myers), and creepy local types who obviously know more than they’re letting on. Throughout events, snide swipes are taken at consumerism, TV advertising and the manipulative power of the media, particularly through the use of the creepy/insidiously insistent jingle advertising the Silver Shamrock masks and urging viewers to tune in on Halloween night. Little do they know that when they do, chips embedded in the masks will be activated by sinister frequencies broadcast through TV sets and gory death will ensue. Several other films around the time of Halloween III also depicted the media (and TV sets) as forces of evil – the likes of Poltergeist and Videodrome for example. At various stages throughout, Carpenter’s original Halloween can be seen playing on TV sets, thus continuing the series’ mildly reflexive and knowing humour. While the characters are never fully developed and some of the performances are quite ropey, Tom Atkins and Stacey Nelkin are likable leads – him, a hard-drinkin’, hard livin’ divorcee, and her, a gutsy, headstrong city gal. Their makeshift romance fails to give the already unfeeling film any sort of heart though. As arch villain and Oirish warlock-blaggard Conal Cochran, Dan O’Herlihy layers on the ham with a trowel and a crafty wink. 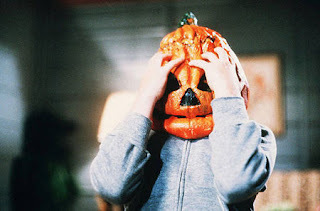 The violence and bloodshed in Halloween III is much more graphic than anything seen in the series thus far, and more closely resembles that depicted in Halloween II. Skulls are crushed in, heads are ripped off and faces are ruptured by laser beams. 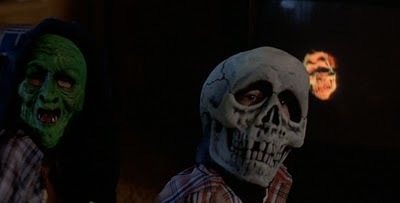 In the film’s nastiest and most sickening scene, when the power of the masks is demonstrated on one unlucky family in a dank and clinical test room, a young boy’s head seems to explode into a writhing mass of snakes and insects that squirm and thrash their way out from under the mask he’s wearing. Repulsive and cruel, this moment cannot be unseen – but it’s fair to say it disgusts more than scares. What adds to the cruel and nauseating tone is the sight of his lifeless eye peering out unseeing from the eyeholes of the mask as his head disintegrates into gross stuff. Gahhhh! The film’s use of ancient pagan rituals and Celtic mysticism as a means to inflict pain and suffering lends it an intriguingly off-kilter feel, while the giant broadcasting room inside the factory, with its myriad TV monitors and flickering 'control panels', is undeniably kitschy. 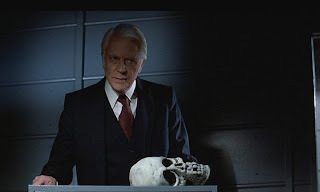 Cochran’s (admittedly hair-brain) plot to return Halloween to its bloody origins of human sacrifice and death – in which the land runs red with the blood of animals and children – is the dark reveal at the climax. He discusses Samhain, the ancient Celtic 'festival of the dead', which was immersed in the blood of human sacrifice, and takes pot-shots at how the season has been commercialised and far removed from its sinister origins. Later Halloween sequels would also draw on this aspect of ancient Celtic tradition in an attempt to explain away Michael Myers’ powers and apparent invincibility. The town of Santa Mira is an Irish settlement and links to Ireland are seen everywhere – a bar called Dublin Inn, maps of Ireland on walls, the grotty Rose of Shannon motel and the dodgy Oirish accents of the locals. Despite its shortcomings and mild ridiculousness, Halloween III emerges as a daring and ambitious film – particularly following on from the rudimentary slasher shenanigans of its predecessor. Stark, cold and downbeat, its pessimism and fatalistic outlook mark it as one of the more interesting Halloween entries – even if it is unrelated to the Myers saga – and a film with a genuinely nasty, impish core. Nice to see this gem getting props. Good write up! I love the original film -- it's my favourite film of all time -- but I also like Halloween III best of all the sequels. I still think it's a great shame that the anthology experiment didn't take off, as who knows what we could have seen? You ever seen the George Romero flick, "Season of the Witch?" @Kelvin - Yes, I agree. It might have been interesting to see how the series would have fared as an anthology experiment. @Andrew - Alas, I haven't seen Romero's Season of the witch yet. I've read good things about it though and hope to check it out at some stage. Do you recommend it? @Wes - I loved how this entry subverted all expectations and tried something new. Interesting point you made about how it might have been received if it had been released as a stand-alone film and not part of the Halloween series. As it is I think it has a cult following anyway because it is an oddity in the franchise. 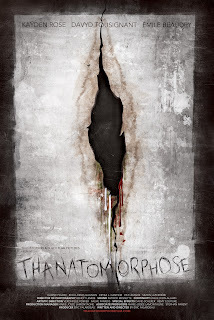 I like it - much better than some of the other Halloween titles that followed... More on those soon! I used to really not like this movie. But I just watched it again last week and I was surprised by how much I found myself enjoying it and how much better it was than I remembered. @Wes - "Bergman-on-a-budget flick with a hint of supernaturalism" - I actually like the sound of that! Martin is probably my favourite Romero film. @Cody - I really enjoyed revisiting this one. Some of the images in it were still as strong in my mind from when I first encountered it on late night TV. The second best HALLOWEEN film after the 1978 original. Arguably the most impressive Carpenter/Howarth soundtrack of the lot. A note on Romero's SEASON OF THE WITCH - I reviewed this some months back James...worth watching...but 'Bergman-on-a-budget', poor old Ingmar would be turning in his grave! Yeah, this one is my favourite after the original and H20. And one of my absolute favourite soundtracks too! So moody and ominous. I still like this movie, even though it can be a slog to get through at times. Great, creepy soundtrack and a very cool ending. Yep this movie takes your mind off all the slasher monsters but the jingle silver shamrock theme should have been eliminated because it was over-used and annoying, otherwise it was fantastic! You kind of forget about michael myers in this one altogether so yes they should have made an anthology series.